So here comes a new innovative atty from Joyetech, called as RFC Riftcore Duo Tank, which adopts the very impressive coil-free technology that’s used in the hot NCR RDA before. Now Joyetech improve this tech possibility with the brand new dual RFC heaters that features safe materials and fast heat conduction. 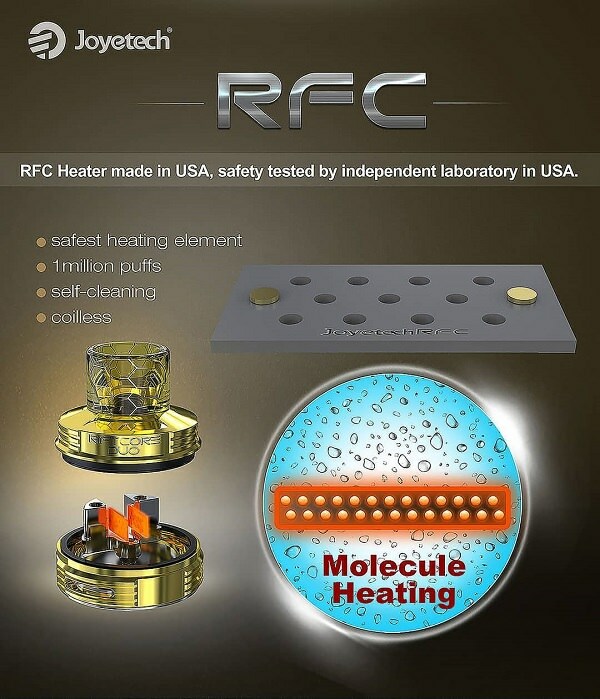 Moreover, the RFC heating element comes with many venting holes that is helpful for efficient and even juice vaporizing. And the special heating material makes this RFC Riftcore DUO tank last for one million puffs and also support self-cleaning function for long-term usability. Simply put, the Joyetech RFC Riftcore DUO will free your hands with complex coil building but still offers you amazing flavorful clouds that can compete to RDA/RTAs as well as saving your cost on frequent coil replacement. Here comes the new round of our flash sale. Product list as below. Ends at 23:59PM on May 10,2018. 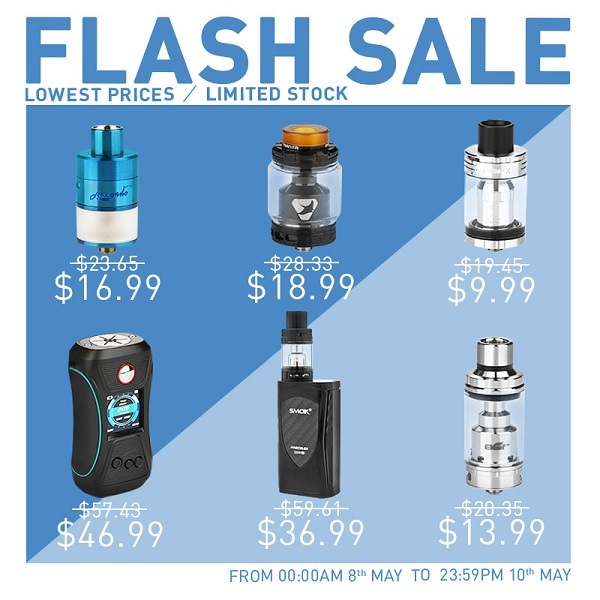 Next round of flash sale will start from 00:00AM May 11 to 23:59PM May 13. Check the product list in advance. The Diamond Mini Kit is a new addition to IJOY family, which keeps the aesthetics and power performance of the original Diamond kit to cater for vapers who love the design of the Diamond but prefer a smaller size. 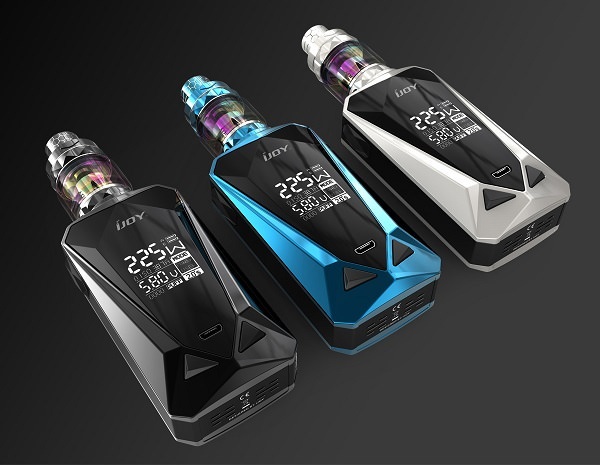 Inheriting the stylish diamond multi-faceted cutting design of the original, the IJOY Diamond Mini presents in a more compact size and reduces max output power to 225W. It runs on dual 18650 batteries and supports various TC wires, TCR function as well as unique custom user mode. The Diamond mini also features a large OLED screen for clear vape data display and a micro USB port for firmware upgrading. Together with this new mod is the Diamond Baby Subohm Tank, which is 4ml in juice capacity but can be also changed to 2ml with the included extra glass tank. It utilizes the new DMB-Mesh and DMB-DM coil to offer you great vapor and flavor combining with the large adjustable bottom airflow slots. Plus the same diamond design, the Diamond Baby subohm tank makes a perfect match with the Diamond Mini mod, which is dedicated to bring you amazing visual and vaping enjoyment. The Priv M17 Kit is a newly released portable setup from Smok, composed of a built-in 1200mAh Priv M17 battery mod and a 2ml Stick 17MM tank. The mod is very slim with ergonomic design, providing you a comfortable grab feel. Though the Priv M17 is not a big mod, it can be still powerful, supporting a max output power of 60w, which could meet your expectation for a slimmer mod. It features a big lateral fire button to offer convenient operation, a LED indicator to clearly show you the working status of the mod and multiple protections to avoid potential risks. The integrated Stick 17MM tank features adjustable airflow system and Stick M17 coil, which will bring you great flavor and incredible vaping power together with the Smok Priv M17 mod. 9 stylish colors for your option. Voopoo introduce a new dripper tank, called as Rune RDA, which is designed to cater for both squonk users and regular drippers. It adopts high quality SS material and neat design. Featuring a postless build deck with vertical coil connection structure, the Voopoo Rune enables vapors to enjoy a simpler DIY process and allows for maximum E-liquid capacity. The four adjustable side airflow holes combine with the four direct bottom-feeding-to-side juice wells, offering an incredible cloud and flavor with no juice over-spray. The Rune RDA is compatible with both 810 and 510 resin drip tips to cover different vapers’ needs. 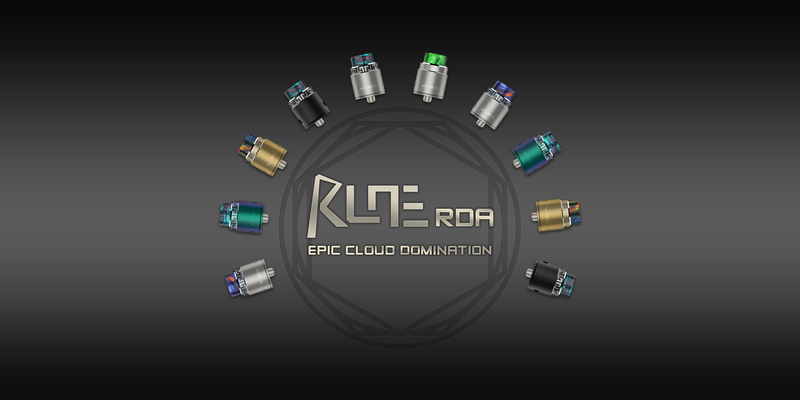 If you are a new user and want to use RDA, Rune RDA will be your good choice! Here comes the new round of our flash sale. Product list as below. Ends at 23:59PM on May 13,2018. 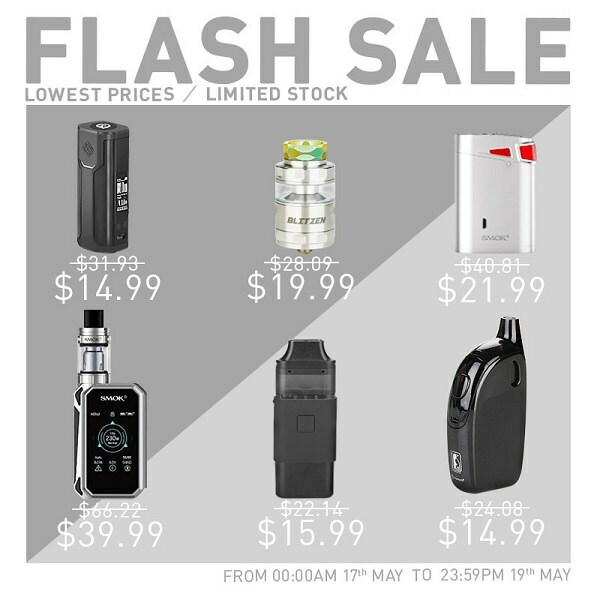 Next round of flash sale will start from 00:00AM May 14 to 23:59PM May 16. Check the product list in advance. Vapefly Galaxies MTL RTA is a new innovative rebuildable tank dedicated to bring you a superior MTL vaping experience. 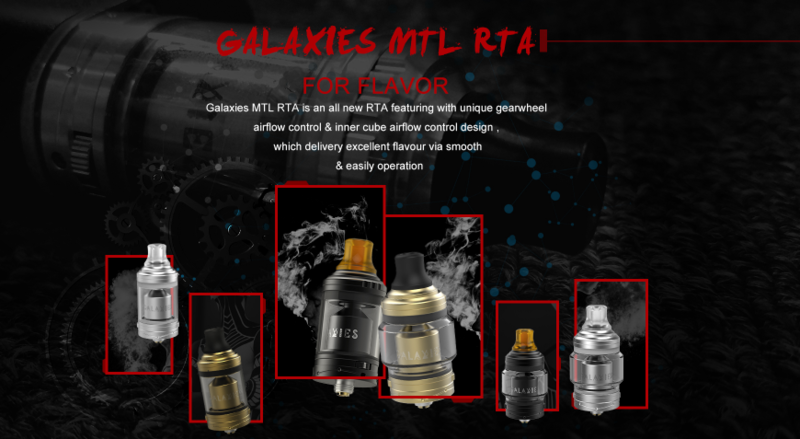 Featuring a special gearwheel airflow control switch with 8 kinds of air hole combinations and an inner cube airflow set design, the Galaxies MTL RTA will offer a precise air control as well as delivering amazing flavorful clouds. It adopts the simple two post build deck for easy single coil building. It’s 22mm in diameter with 3ml tank capacity that can be also increased to 5ml with the included bubble glass. And it’s also available in a TPD version with a removable silicon part. No matter you prefer an airy or tight MTL draw, this Vapefly Galaxies MTL RTA will definitely meet your needs. Hey guys, remember what day is this Sunday? Yep, the Mother’s Day. It’s the best time to show your appreciation to your lovely mothers. What gifts have you prepared for you mom? A bunch of flower, a good dinner or something special? Or still looking for a Mother’s Day gift idea? Well, we may be not able to give you many innovative suggetions, but we can definitely give you some recommendations if you wanna help your mom make a switch from smoking to vaping. So this time, we have selected several nice starter kits that are suitable for women with a 10% off discount and offer you some free gifts with your order. Here comes the new round of our flash sale. Product list as below. Ends at 23:59PM on May 16,2018. 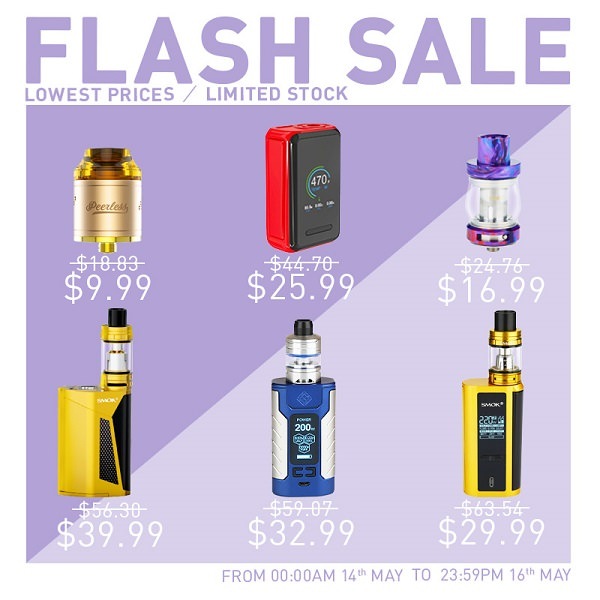 Next round of flash sale will start from 00:00AM May 17 to 23:59PM May 19. Check the product list in advance. Eleaf just release a new powerful and gorgeous setup - the Eleaf Lexicon Kit, which consists of the well crafted Eleaf Lexicon box mod and the elegant ELLO Duro atomizer. The hightlight of the Lexicon mod is its fantastic color LED lights design that features various colors and effects to illuminate at night, offering you great visual enjoyment. Powered by dual 18650 batteries, it can fire up to 235w max and support various work modes. With centered 510 pin, the Lexicon accepts tanks of various diameters and can handle tanks up to 26mm without any overhang. The included ELLO Duro tank is available in a standard 6.5ml version and a 2ml TPD version, featuring a beautiful acrylic looking, convenient slide-open top filling system and adjustable bottom airflow design. It utilizes new HW-N (Net) and HW-M (Multihole) coils to deliver an intense and flavorful taste. All in all, this 235W Eleaf Lexicon Kit will presents you an unprecedented vaping experience. 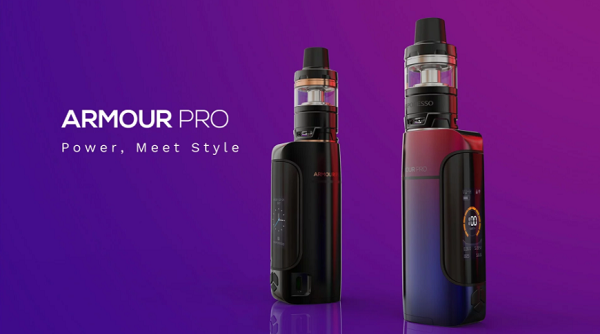 The Armour Pro Kit is a new setup from Vaporesso with a beautifully simplistic and portable design, composed of the slim Armour Pro Mod and a 2ml/5ml Cascade Baby Tank. Adopting the advanced omni board 4.0, the Armour Pro can fire within 0.002s, delivering tasty clouds at the very first puff. It comes with a huge side fire button that is amazingly embedded with a 0.96 inch color screen to display all vape data clearly. Moreover, the Vaporesso Armour Pro is compatible with single 21700/20700/18650 cell and supports 2A quick charging. The Cascade Baby tank inherits the original’s revolutionary isolation structure that separates the coil and juice chamber, ensuring consistent and intense flavor. And the triangle airflow system enables the Cascade Baby to produce smoother and denser clouds. Plus wide coil compatibility, easy top filling and safty lock design, it’s a perfect match for the Vaporesso Armour Pro mod that will bring you an enjoyable vaping experience. Here comes the new round of our flash sale. Product list as below. Ends at 23:59PM on May 19,2018. 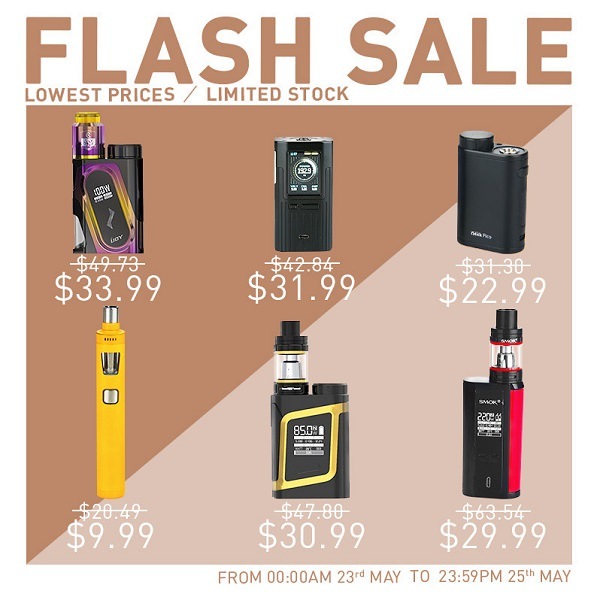 Next round of flash sale will start from 00:00AM May 20 to 23:59PM May 22. Check the product list in advance. 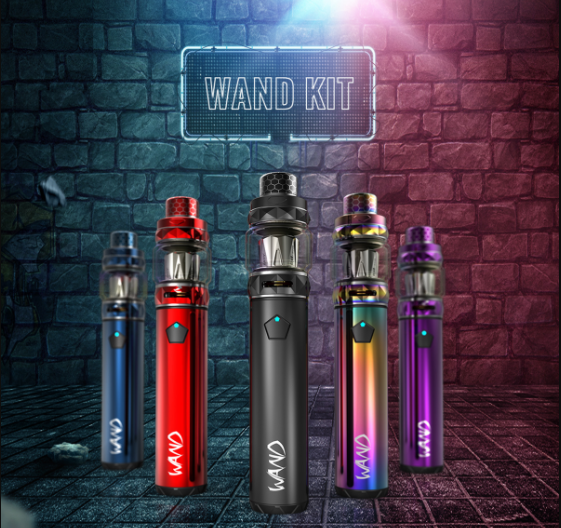 IJOY Wand Kit comes with the newly released Wand mod and the 5.5ml Diamond tank, presenting in a stylish and portable design. The IJOY Wand is a tube mod with 2600mAh built-in battery that can fire up to 100w max. Adopting the IWEPAL control chip, it supports various protection functions to make this device more durable and safer to use. Moreover, it features two color indicators that can clearly show different working conditions. The paired Dimond tank features a fast screw-cap-type filling system, large adjustable bottom air holes, and innovative DM coils, which will bring you tasty vapor and great vaping experience together with the Wand mod. Here comes the new round of our flash sale. Product list as below. Ends at 23:59PM on May 25,2018. 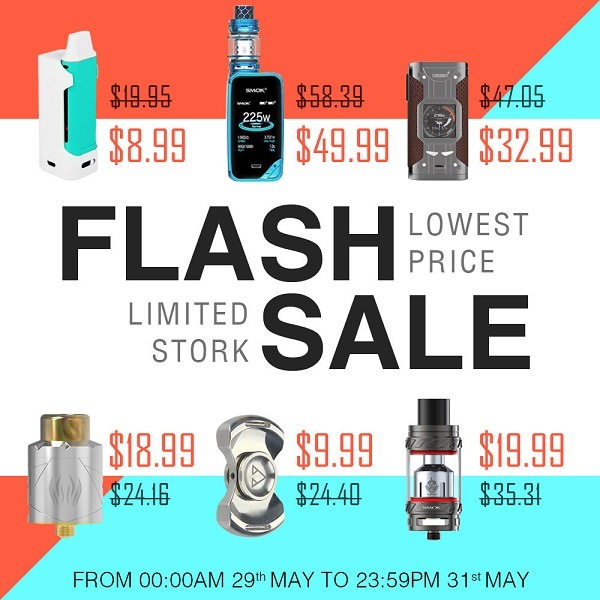 Next round of flash sale will start from 00:00AM May 26 to 23:59PM May 28. Check the product list in advance. 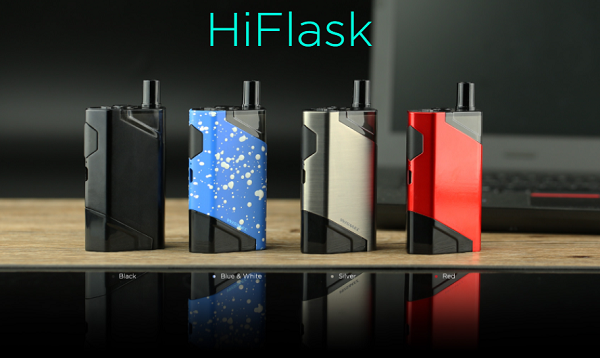 Here comes the first vape pod kit from Wismec, called as HiFlask, which features a super compact size and stylish appearance. It includes a 2100mAh built-in battery and a 5.6ml/2ml replaceable cartridge. The HiFlask battery adopts direct output mode and supports 2A quick charging, allowing for a simple and convenient vaping. The HiFlask cartridge is made from eco-friendly & durable material that can provide you unexpected vaping enjoyment when relling with different e-liquids. Moreover, it firstly utilizes an innovative JVUA (juice vertical & u airflow) system that is good for delivering pure flavor and decent clouds. The HiFlask also comes with a cartridge lock, ensuring convenient replacement as well as avoiding any unintentional behavior. If you wanna an efficient and reliable pod kit, this Wismec HiFlask would be a good choice. Worldwide free shipping for each order over $20. Hey guys, here you have a new regulated squonker choice - the Desire Cut Squonk Box mod, which features an ergonomic shape with multiple finish colors, a triangle fire button for easy operation and a large 0.96-inch screen for clear data display. It also comes with a breathing display light on the bottom of the screen that will show the status of charging. Adopting one single 21700 or 18650 battery as power supply, the Desire Cut can fire up to 108w max and also supports various protections to ensure safe vaping. It includes a 7ml squonk bottle to last you a whole day for chain vaping and the squonk bottle features a knurled threaded cap for convenient juice refilling. 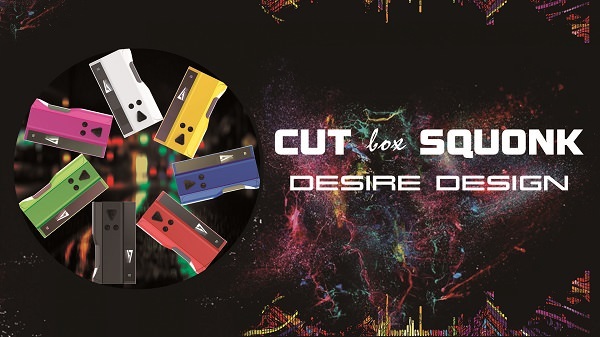 All in all, this new Desire Cut Sqounk Box Mod will definitely bring you an enjoyable squonking experience. Hey guys, here comes our Memorial Day Sale, starting from May 5 to May 28, 2018, with 8% off across the site (flash sale excluded), worldwide free shipping over $20. Discounted price will automatically show up when the sale initiates. Please don’t miss this chance to grab your favorite stuff during this WEEKEND SALE!!! Thank you & enjoy shopping at Buybest. Here comes another powerful and outstanding setup from Vaporesso - the Polar TC Kit, which consists of a 220W Polar mod and a 6.5ml/2ml Cascade Baby SE Tank. Equipped with the advanced OMNI Board 4.0, the Vaporesso Polar can support 0.001S super fast firing speed, 2.5A quick charge, multiple protections and super player mode, which ensures a high playability integrating with a 2-inch TFT screen. It runs on dual 18650 batteries that can fire up to 220 watts max and support various work modes. The included Cascade Baby SE tank inherits all the great features of its predecessor such as the revolutionary isolation structure, triangular airflow system, safety lock mechanism and awesome GT coil series. It makes a perfect match with the Polar mod, giving you an amazing visual enjoyment as well as fantastic vaping experience. Here comes the new round of our flash sale. Product list as below. Ends at 23:59PM on May 31,2018. 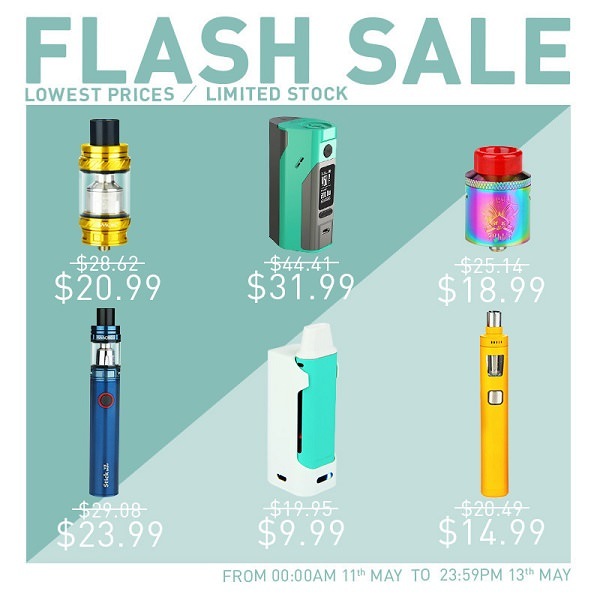 Next round of flash sale will start from 00:00AM June 1 to 23:59PM June 3. Check the product list in advance. 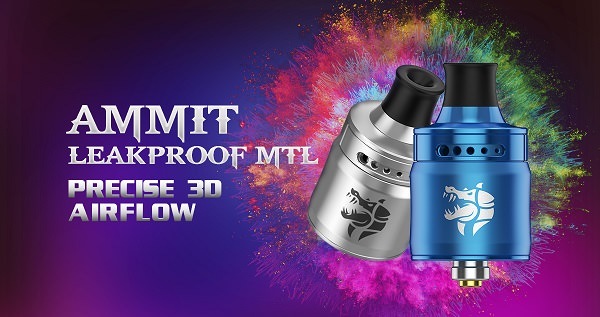 MTL vapers, today we bring you a new excellent MTL atty from Geekvape, called as Ammit MTL RDA. It’s a 22mm rebuildable dripper tank with exquisite appearance and outstanding performance. The Ammit MTL RDA comes with a wide single coil build deck with two deep juice wells, allowing for easy building and more juice capacity. It features an innovative dual-layer chamber structure to provide outstanding heat dissipation effect. Moreover, this Geekvape Ammit MTL RDA adopts a 6-hole adjustable top airflow system with 12 airflow combinations, which forms a 3D airflow transferring air from top to bottom together with the two big air holes on the build deck, producing unbeatable flavor while avoiding leaking problem. It’s also equipped with professional MTL drip tips that fit on 510 connector and comes with two different diameters for various preference. If you are looking for a nice MTL atomizer that can provide precise MTL vaping experience as well as easy building, this new GeekVape Ammit MTL RDA would be good choice.